This disease similar to RSA/RBD falls under the broad spectrum of cyanobacterial overgrowth forming a mat over the aquarium floor and often the corals themselves. Its colour is as the name suggests black to dark blue-green. This disease is rarely found within aquariums but has been known to occur. This disease is most commonly associated with high levels of organic nutrients within the aquarium, which in turn may be influenced by changes in light levels. Despite the common name of this disease, the causal agent is not actually an alga at all, but a consortium of cyanobacteria. Red Slime Algae (similar to BBD), is reported to be treatable by commercial products such as Ultralife Red Slime Remover, Boyd Chemi-Clean, and Blue Life Red Slime Control (Brang, 2010). However, many of these diseases are reported as a sign of poor water quality, so most aquarists propose reassessment and improvement of aquarium water quality (reducing levels of nitrate and phosphate and monitoring light levels and improving flow) as the most effective treatment. 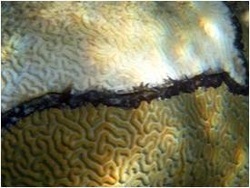 BBD in the wild has been treated in a variety of ingenious ways, Bruckner (1999), tried techniques such as; 1) the complete removal of the BBD lesion using a syringe, then covering with modelling clay or underwater putty, 2) shading of the BBD lesion using sun screens and, 3) addition of the urchin D. antillarum to cages containing the diseased corals. 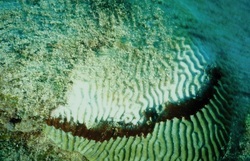 They reported all treatments were successful but to varying degrees, with the highest success rate (> 95 %) being the use of underwater putty following removal of the microbial mat. 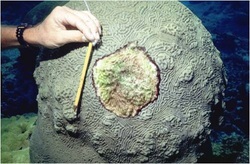 This technique along with shading of infected colonies (Griffin, 1998) may be suitable for corals suffering BBD in tanks or when applied to small scale recovery programmes but remains impractical to treat large numbers of corals over large areas. Added to this, because BBD is believed to be transmitted in water, the removal of the band may liberate potential pathogens and aid in transmission to downstream corals.